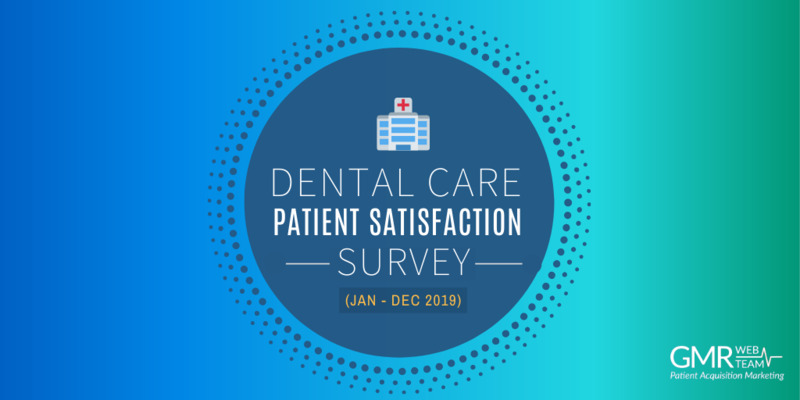 This survey measures the LOYALTY of patients for their dental offices and helps dentists understand the needs of their patient for developing efective patient related programs to address their pain points. This will help in developing a stronger bond between patient and physician and the patients will become the advocate of their physicians resulting in more Referrals fueling growth. 89% of patients gave positive ratings about their visit to their dentists. 6% of patients rated their experience negative, whereas 5% rated their experience neutral. Sentiment analysis of all patients’ comments about their experience suggested contentment among 88% and trust among 2% of all patients, consistent with their positive ratings. Friendly, Professional, Recommended, and Love were the dominant words used by patients who rated their experience as positive. Appointment, Insurance, and Cleaning were the dominant words used by patients rating their experience as negative. Why the Dental Patient Satisfaction Benchmark Report? Develop a benchmark of patient’s loyalty for the entire Dental category. Help individual dental groups and dentists track their Net Promoter Score vs. the entire category. Identify patients’ pain points, develop programs to address these pain points, and track how these initiatives are impacting those pain points. An online survey was conducted from January 2017 through June 2017 among 638 patients, belonging to a handful of dentists in the U.S. who are using the RepuGen service. All the information (rating score and comments) was detached from patient and doctor identification to make the report HIPAA compliant. RepuGen cannot backtrack comments or sentiments to link Net Promoter Score or sentiment to any patient or dentist. Passives: Patients giving a rating of 7 or 8 to their dentist were classified as Passive. They are satisfied but NOT enthusiastic patients who are vulnerable to competitive offerings. Detractors: Patients giving a rating of 0 to 6 to their dentist were classified as Detrac-tors. They are unhappy patients who can damage the reputation of their dentist and impede growth through negative word of mouth. How Do Patients Rate Their Visit to Dentist Offices Based on Their RepuScore? ** The Net Promoter Score is an index ranging from -100 to 100 that measures the willingness of customers to recommend a company's products or services to others. It is used as a proxy for gauging the customer's overall satisfaction with a company's product or service and the customer's loyalty to the brand. 89.43% of patients visiting dentists walk away with high positive feelings. 81% of these patients can potentially be promoters for dentists if the appropriate process is used. 18% of current patients are either very unhappy or NOT very enthusiastic about their current dentists and could leave them in the near future. This key measurement of patients’ satisfaction with their visit to dentists suggests a very high level satisfaction. However, up to 18% of their current patients are dissatisfied or could leave for another dentist. 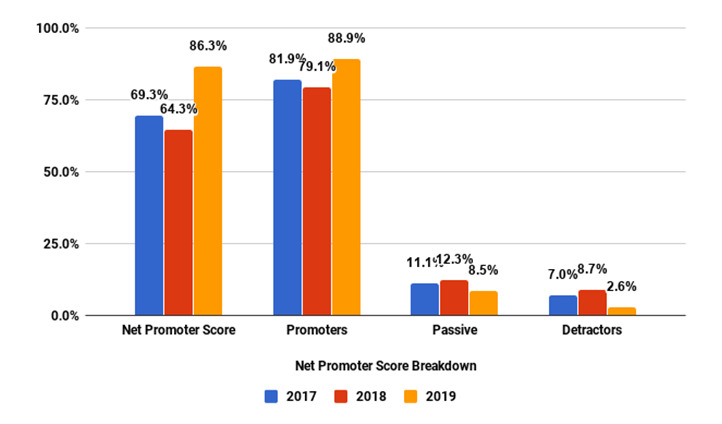 A net promoter score of 68 suggests the possibility of an opportunity for dentists and medical practices to use a referral program to acquire new patients from their existing patient base. 89% of patients left their dentist with a feeling of contentment. Only 44% of those exhibiting “content” emotion showed high intensity. This suggests room for dentists to improve their communication with patients and solidify their relationship with patients. Intensity of the majority of patients showing “trust” emotion was medium, thus leaving room for improvement on establishing trust between patients & dentists. Similar to “trust”, patients “anger” emotion intensity was medium; suggesting room for patient recovery by handling unhappy patients proactively. While 89% of the patients are “content” with their dentist visit, the intensity of the emotion among the majority of patients is medium or low. Dentists and medical practices should con-sider instituting programs to increase patient satisfaction. Given that 82% of “trust” emotion intensity is medium to low, dentists and practices should work on building higher trust. Friendly, Professional, Recommended, and Love were the most used words among patients who rated their visit between 9 and 10. Appointment, Explained, Personable, and Experience were some other frequently used words. Appointment was the only “negative” words among the top-20 most frequently used ones. Frequently used words by satisfied patients should resonate with the happy patients, thus could be used to build the expectation for new patients. An example could be making a bold statement like “Friendly, Professional, Recommended, Love – These are the most used words our patients use to describe their visit”. Insurance, Cleaning, and Scheduled are other negative words. Frequently used words by unhappy patients allow the dentist to gauge patients’ reasons for dissatisfaction. However, given the fact that the comments of patients were de-identified, we can assume that appointments, insurance issues, and cleanliness of the office are some of the major concerns. These words are more relevant when linked to the patients (which individual account holders can do) and also when viewing the complete review of the patients. Why is the Dental Patient Satisfaction Survey so important?